This last weekend the trip to SLC on the bike was both good and bad. The bad was because if my knee. The tendon took a couple minutes to stretch back out. This meant when I came to a stop, I could only put down my right foot. That’s not good. If I tipped to the left, I’d have gone down because I had nothing to stop it. Once I was rolling though, it was smooth sailing. The bike loves to cruise. It ran flawlessly and turned in 48 mpg. I topped off in Lapoint and didn’t have to gas up again untill I was well into SLC. On my Magna or Superhawk, I’d have refilled twice more. I’ve never had a bike with this much range. I couldn’t be happier with the Kawasaki. This Motorcycle today… It’s the Kawasaki ZX-11. When it was in production, this bike was the fastest thing on two wheels. The acceleration was unmatched and the top speed was… far too fast for any reasonable person to want. Now, there are faster and quicker bikes out there. But the ZX-11 remains a monster and faster and quicker than most still. Now the current Speed King is the ZX-14, but the 11 is it’s Daddy. 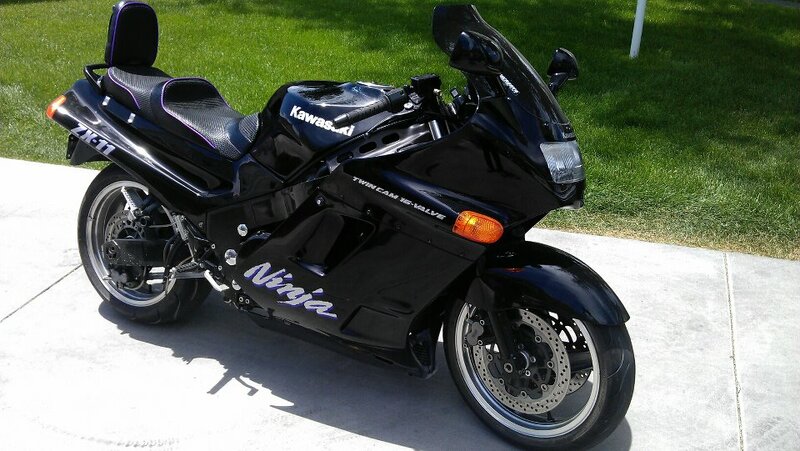 Here’s the thing about this ZX-11 here. It’s mine. I picked it up yesterday. When I got my Superhawk, this was the bike I had gone out to get. Unfortunately the bike was in pieces as the owner was working on it. I couldn’t just jump on it and run, so I had to go to a second option. I loved the Superhawk, but it wasn’t what I had planned on buying. For that reason I still wanted one, even though I had a great machine. The Superhawk’s V Twin was fantastic engine, low RPM burbling, instant throttle response through all RPM’s… it’s a great machine to ride. But the power did have a tangible top end. 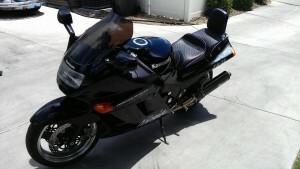 The ZX-11, the power is different… It’s more like I’m riding a Jet Engine strapped to a pair of wheels. I twist the throttle and the RPM’s come up, but not the speed… not yet… Like a Jet Turbine spooling up, the thrust doesn’t come until it spins up fast. But when it comes, it comes in a big way. It surges forward like an F-22 Raptor and it doesn’t feel like there is any limit. I thought the Superhawk was a fast bike. I really did. Because it was, but the ZX-11 is fast on a whole new level. I’ve named this bike “Shadowfax” because it’s shown me the meaning of haste. It’s also much more comfortable. The riding position isn’t “Attack Mode”. It’s more upright. Less fatiguing. More wind protection. You could ride this much farther distances… which is cool because it has a larger fuel capacity for more distance. A much longer range machine. Which is just what I’ve been wanting. It’s a much wider bike. Heavier. But it still feels agile. As much as the Superhawk was. But I’ve promised my wife that I was done with the knee dragging. My shoulder is far more injured than we knew and gives me more pain now than my arm and knee did after I crashed. So my bride says I need to slow the hell down. And I agree. I do. But she says that in a controlled environment, I can pursue my goal… 200 MPH. It’s a compromise, but a fair one. Rather hard though… because the bike wants to cruise at hyper velocity, so smooth and stable it’s like it’s nothing. Speed is deceptive here. With the wind protection, power, I thought I was cruising at 60. I looked down and saw I was rolling at 90. I have to check my speed all the time because it keeps building and I’m always letting off the gas. This bike wants speed… it’s made of it. 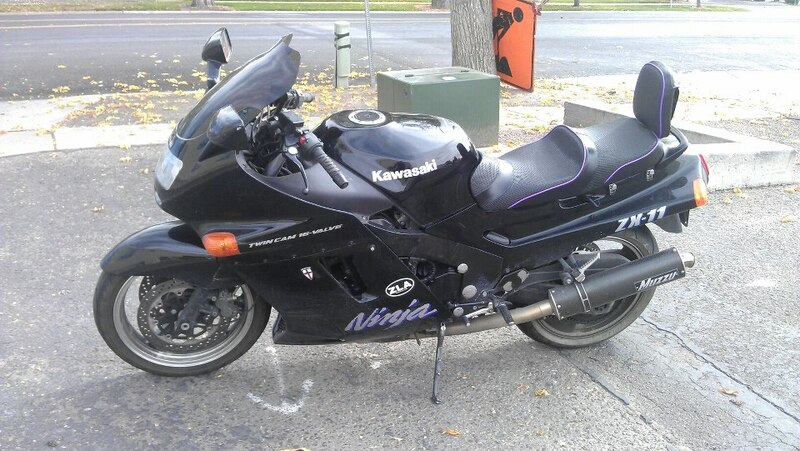 It’s also the first Kawasaki that I’ve ever bought. It’s a far cry from a Honda. In fact, it’s Honda’s chief rival for the Jap Bike market. While I remain a Honda fan, these big Ninjas are truly impressive machines! Update: Sold the Superhawk for enough cash to not only buy this machine, but inspect it, register it, and pay the monthly mortgage.